Spend the summer with SMO! 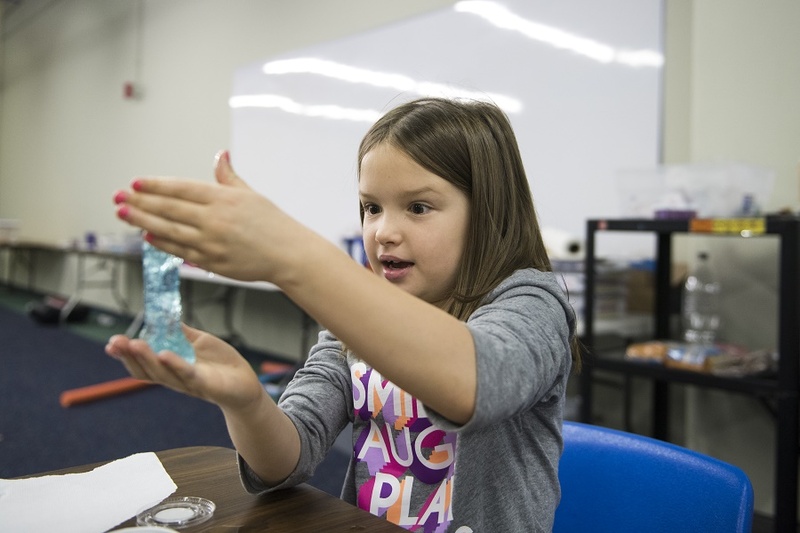 Early Explorers (pre-K and kindergarten), Explorers (grades 1-3) and Innovators (grades 4-6) can spend up to eight weeks with the educators at Science Museum Oklahoma exploring the awesome power of science! Make things that fly, play with water, recycle, upcycle, break things and learn the science of grossing people out. Each day will be its own adventure! Hours and Rates: Camps for Early Explorers (Pre-K and Kindergarten) are from 9 a.m. to noon and are $100 per camper, per week for members and $125 for nonmembers. 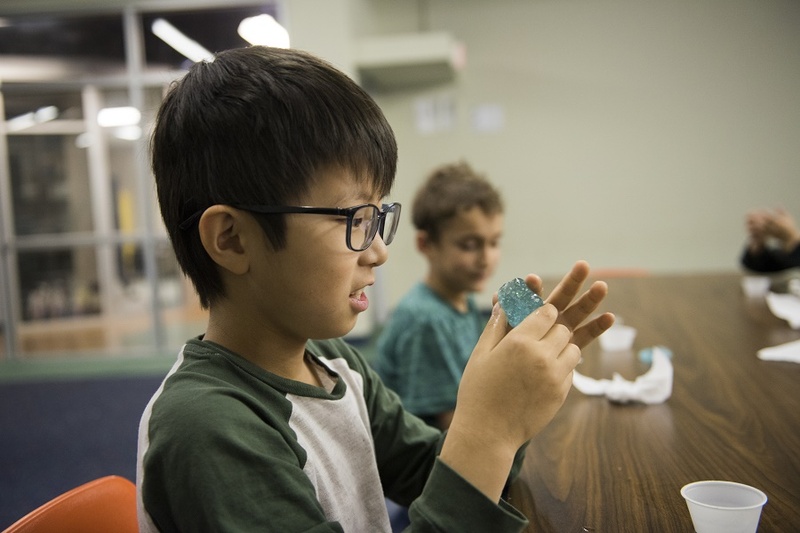 Camps for Explorers (Grades 1-3) and Innovators (Grades 4-6) are from 9 a.m. to 4 p.m. and are $225 per camper, per week for members and $250 for nonmembers. What to Bring: Early Explorers are required to bring a snack for each day of camp. Explorers and Innovators are required to bring a lunch and a snack for each day of camp. Available Space and Registration: Camps are limited to 15 children per age group, per session. Camps are marked "Limited Space Available" when less than five spaces remain and as "Sold Out" when full . If your preferred camp is sold out, please contact Guest Relations at (405) 602-3760 to be placed on our waiting list. Parent Packets: A completed Parent Packet is required for each camper. Oh, those wonderful slippery, goopy, and sticky polymers! How many different slime recipes can we try? Experiment with SMO’s special crunchy slime, see how far our elastic slime can stretch, test our instant snow and cloud slime, and even take some home! Summer's here and we’re celebrating the great outdoors! Explore the science of our amazing earth with help from our horticulture experts. Build a bug hotel, create DIY herbal insect repellant, and even arrange your own miniature terrarium. We’ll cultivate some amazing knowledge of what you can discover in your own backyard. It’s all fun and games and it’s all about science! Before we had any written record about them, humans played games. Games continue to be played in all sorts of ways — from video games to card games and live action role play. Join in as we play to detect the science in gaming and game creation. Get to know the rules and gaming can be an exciting challenge! What’s inside your body, what does this smell like, and what exactly is a burp? Get your human body to camp where we have answers to all these questions and more. Experience your five senses in new and exciting ways! Let’s examine our heads, shoulders, knees, and toes! Experience hands-on forensic science activities in this suspense filled camp. Get hands-on with fingerprinting, plaster casting, blood typing, and more. By working as a team, can you solve a crime? Have you ever wondered about the science of everything? Come explore the atoms that make up our universe, delve into the chemistry of cooking, and discover why matter should matter to you. It’s tinkering time! Do you love taking things apart? Putting things together? That means you are a serious tinkerer! Together with trained professionals we’ll create a Rube Goldberg machine, sculpt squishy circuits, investigate weaving, and find all kinds of objects to build and design. From tombs to pharaohs, this week is all about exploring the ancient history of the golden empire of Ancient Egypt. Investigate mummification, hieroglyphics, and build your own pyramid. Explore ancient cultures, inventions, and the importance of the science of archeology. Art and science often go hand in hand — in this extra colorful camp, we’ll explore how to make your own paint, create photographic masterpieces with pinhole cameras, and delve into the study of video and stop-motion. This camp is where art, science, creation, and discovery meet! Zap! Boom! KaPow! It’s time to use our powers for good with some super science! Tune in your spidey senses and create a sticky spider web, harness the power of weather with melting ice, and find out what can we shrink using our spectacular science abilities! It’s what’s on the inside that counts! We’ll examine the chemistry, structure, and engineering of the body and analyze the networks of its nerves, fibers, and bones. Delve into the impact that people have on our surroundings and investigate the impact the world has on us. Science can be so many things. Living organisms and vital processes can be good, great, gross and downright bad. From edible slime, exploring germs, creating Petri dish art, and what was that smell?! It’s all good, but bad, and mostly gross. Dive in — we’re going on a deep sea adventure! Examine Cretaceous fossils, take a look inside SMO’s Oceanarium, and discover what lives in different types of shells. Don’t miss the boat, we’re in for a whale of a good time! Survival can be challenging. Get hands-on experience with how to endure in the wilds of different environments. Whether a disaster has struck or zombies are swarming, we’ll experiment and learn how to apply practical skills like shelter building, filling a bug-out bag, and how to repurpose everyday items needed for survival. We’re celebrating the 50th anniversary of the moon landing! Take one small step into the world of outer space discovery as we explore what earth looks like from space, create fizzing planets, find out exactly “orbit” means, and more. Join us to take this leap! Fifty years sounds like a very long time, but the Apollo 11 mission is still just as important today as it was in 1969. Celebrate this fantastic feat of space travel as we delve into the study of exoplanets, solar system orbits, create satellites, and traverse the stars with a visit to the Kirkpatrick Planetarium. No atmosphere, no weather, and no oceans of water … with a steady rain of asteroids and comets. This is just a small glimpse of how life on the moon’s surface would feel. Very few have even stepped foot there — and this is where our adventure begins. Head to SMO to celebrate Neil Armstrong, Buzz Aldrin, Michael Collins, and all of the women and men of NASA who made the Apollo 11 journey possible fifty years ago. It’s finally time for the gross stuff — this week is all about the eww! We’ll experiment with creating elephant toothpaste, erupting goop, get an up close look at worms. It’s gross, it’s science, and it’s awfully awesome! Possibilities surround us. With a little ingenuity, a lot of innovation, and whatever's laying around, we can build just about anything. Try your hand at doodle bots, plastic fusion, and even amazing shrinking plastic. Check out a 3-D printer, use some power tools, and get a little messy as awesome ideas come to life! Travel way, way back, further than da Vinci, even further than Archimedes — and you'll find machines. We’ll examine large machines, ancient machines, and even tiny machines in “Life Imagined,” SMO’s automata exhibit. Experiment with steam energy, incline planes, and levers, and pulleys. Get ready to design and build machines in this mechanically wonderful camp. Seatbelts everyone! Join us for a magic adventure! What grows in a Petri dish? Can soap make a cloud? Let’s find out all these super science questions together, with The Frizz, and even visit with a real Lizzy the Lizard and other awesome animals! To make your week complete, you might get baked into a pie! Have your wands at the ready – this wizarding school is ready for some incoming students! Cease to be a mere human and find your wizarding potential. From sorting and plants to potions and spells, we’ll seek the science of this magical realm. Study the chemistry of potions, test programming skills in charms, adventure to find fantastic beasts, and much more. Term begins on July 29th for Wizards 101! Get sorted into your house, become an expert at wizard sports, and discover how magic is just science in disguise. From wand-making to wizards’ favorite drinks, we’ll find the STEAM in the world of wizarding school. Dive into the physics of this magical realm, the chemistry of potions, and much more.